It’s not often that the Man of the Match in the Champions League final of the previous season moves on to newer pastures in the transfer window. However, Real Madrid and Florentino Perez have long since abandoned the traditional. 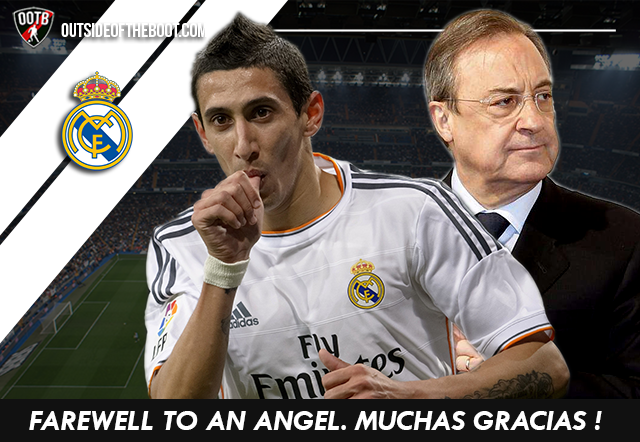 Mark Denis Ong says farewell to now Manchester United player, Angel Di Maria. So it’s finally official: Angel Di Maria has joined Manchester United. One summer after seeing a player I loved watching (Ozil) depart, we see yet another. Call it the way the world works, but it still hurts nonetheless. It’s all great business of course: it also seems like the stalwarts of the Mourinho era at Real Madrid are all moving onto the Premier League – all for club record transfer fees too. As a result, the profits for Real Madrid are quite considerable. Mesut Ozil and Angel Di Maria arrived at Real Madrid at a combined €40m (15m for Ozil, 25m for Di Maria) and depart for €131m (56m for Ozil and 75m for Di Maria). When factored in with the Higuain sale (purchased for €12m, sold for €40m), you’re talking about spending 52m on the 3 players, and earning 171m on their sale, that’s a profit of €119m! And still people are curious as to how Real Madrid are able to afford to pay for Gareth Bale (€100m) and James Rodriguez (€80m)? Yes, yes, yes – Florentino is an astute businessman. How else can you steadily bring in a stream of star and superstar players into your team at unapologetically astronomical amounts? Those of us who are die-hard Real Madrid fans know the answer: by keeping a revolving door. As new star players emerge to capture the hearts and minds of fans the world over, many of them are brought to Real Madrid to be part of its galaxy of stars – and just as these new stars come, the ones from the previous generation are quietly ushered out the door. Ok, maybe not quietly. After all, who leaves for 75m and does so quietly? You do however get the picture: the departure of past stars are used to bankroll the acquisition of new ones. As a result, the club’s roster of stars is perpetually kept ‘fresh’. The acquisitions and sales of Ozil, Higuain and Di Maria also mark a shift in the Real Madrid Star Player Business Model. Whereas the likes of Figo, Zidane, Brazilian Ronaldo, Beckham, Owen, etc. were brought to Madrid as they hit their peaks in their late 20s, Ozil, Higuain and Di Maria joined us in their early 20s, as exciting young players on the cusp of breaking out to become stars (Ozil starred in a WC, Higuain in a River-Boca derby while Di Maria in the Olympics). All were sold at the cusp of hitting their peak, as they hit the latter half of their 20s – to earn maximum returns for their departures. Let’s all remember that Isco, Gareth Bale and James Rodriguez are all yet to hit their peaks too. Certain members of Madridisimo might not agree with the notion of Ozil, Higuain and Di Maria as a star. To them I say: have a look at how the fans of Arsenal, Napoli and now, Manchester United are embracing them. At Manchester United, El Fideo will also inherit Cristiano Ronaldo’s #7 jersey – the same one worn by Eric Cantona. He will also be earning wages that befit a star player: which is EXACTLY what he is. If you’re in doubt as to whether Angel Di Maria befits the status of a star, then just think about it this way: If he played for Manchester United and practically carried his club to win the Champions League and is also the key player for his country’s appearance in the final of the World Cup – then Real Madrid would surely have been interested in him, and be willing to spend €75m on him. I can only come to one conclusion: the only reason Angel Di Maria is not going to be a Real Madrid player this season is that he was already at Real Madrid last season. I first saw Angel Di Maria playing for Argentina in the Olympics and he bewildered me. It was thus not a surprise when some years later, I heard / read that Jose Mourinho elicited an ‘Are you sure! ?’ reaction from Florentino Perez, when he turned Perez’s offer down to acquire David Silva and Jesus Navas (both Manchester City players now), and instead preferred the far-lesser known Di Maria. Under Mourinho, Di Maria became the team’s counterbalance to Cristiano Ronaldo: the more defensively hard-working and responsible wide man who looked more to pass and create chances for his teammates rather than score himself. At his best in that position, his dribbling, passing, crossing and incisiveness on the wing will also be balanced by the sort of effort and discipline that prompted Jose Mourinho to instruct the Bernabeu to applaud Di Maria. Louis Van Gaal was not only in search of a wide man who can create from the flanks, but one who can accept defensive responsibility. I will thus not be surprised to see Di Maria on the flanks in Van Gaal’s 3-5-2 at Manchester United – as an all-in-one fullback/wingback/winger. The choice of course to use Di Maria as an all-purpose wideman in a 3-5-2 or as a full-fledged winger in a 4-3-3 will be down to LVG. 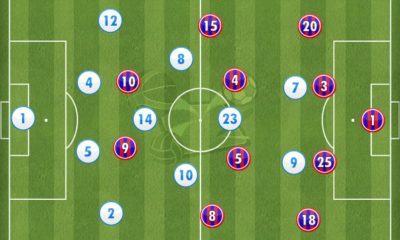 Under Ancelotti, Di Maria very comfortably slotted to become part of a midfield 3: tasked with the role of breaking forward to unbalance the opponent – making him a viable alternative to play as a ‘10’ behind United’s front 2 in lieu of Mata. Angel Di Maria’s introduction during the first leg of the Spanish Supercup and his absence during the entirety of the second leg was very strongly felt. Playing with a midfield 3 of Kroos-Alonso-Modric, it was clear that Real Madrid greatly missed the dynamism and verticality that Di Maria brought to the team while performing his midfield role. And while Jese and James (funny thought: you can call them Jese James) and even Isco are all capable of playing as part of the front 3 of Ancelotti’s 4-3-3, the latter 2 are not at their best in those positions in the way that Di Maria would comfortably fit in. The truth is that Angel Di Maria never quite became *that* favourite player of mine at Real Madrid in the manner that Ozil and Higuain became during parts of their stints at the club. I will never be able to deny however, how important he became to the team. I am personally very grateful to him for his contributions to the club and take comfort in the fact that he’s won it all for Real Madrid: Spanish Supercup, Copa Del Rey, La Liga and the Champions League. I suppose you can say that his cycle at Real Madrid is complete. And finally, it won’t be long Angel Di Maria will also be able to do accomplish another thing I never thought possible: he’s going to make me want to watch Manchester United for the first time in my life. Farewell Angel. Read all our posts on the Real Madrid Team Blog, “The Royal Pages”.